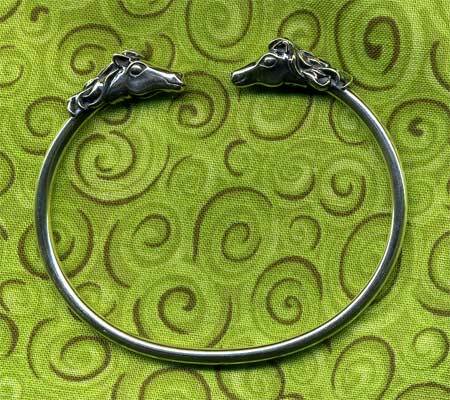 Check out this nifty horse bracelet I ordered recently. I can wait to experiment with it! 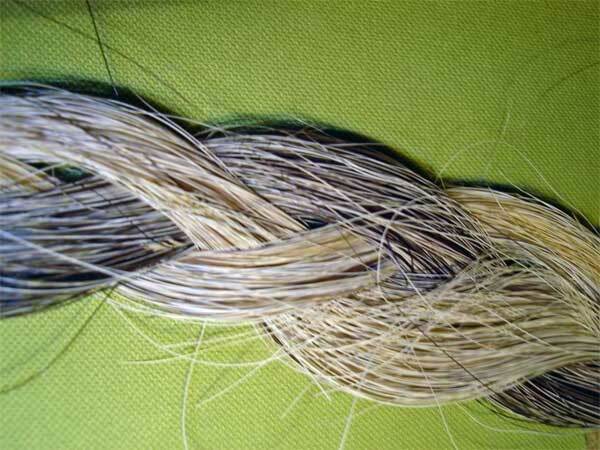 I plan to braid or hitch horse hair around the wire between the two heads (FYI: braiding and hitching are two different types of weaving). It should look very cool when it’s done. I’ll keep you posted. But before I can start on a new project, though, I need to finish a custom piece for a woman in Kentucky who is very patiently waiting. She sent me the hair at right from her horse who died a while ago. 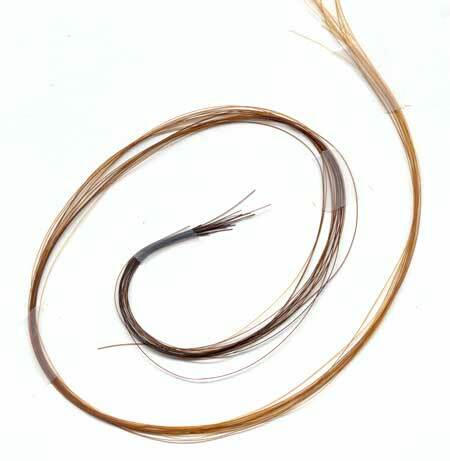 What I find interesting about working with horse hair is the range of colors or, in this case, lack of colors. Take gray, for instance, which is what you’d probably say this hair is. Gray doesn’t seem to exist in horses (and probably people, too). There are black strands and white strands and when you put them together they look gray. Check out gray-haired people and see if it’s true. Okay, maybe that’s only interesting to me, but it makes a huge difference when I braid the hair. Before I weave the bracelet, I have to make pulls, which are groupings of 12 to 20 individual hairs that are twisted together to make a single strand. It’s similar to spinning wool into yarn so you can knit it. If I put all the white hairs in some pulls and all the black hairs in other pulls, when I braided the whole thing, it would look striped. To get the gray effect, I have to put both colors in each pull. These are my pulls before I braid them together. Even though I’ve done this many times, I still don’t really know what it’ll look like until the end. I heard a podcast the other day on Craft Sanity from a printer who said the same thing. After she carves her block, she thinks about what it will look like, but once she runs it through the press visuals she hadn’t expected pop out and others fade into the background. As soon as I’m done I’ll post a picture of the completed bracelet. A few weeks back I created a custom bracelet with horse hair that was very dark at one end, red in middle and blonde at the other. It’s a bit difficult to see the variation in the photo at right, but you get the idea. I had no clue what that was going to look like in the end. In creating pulls I count out the same number of hairs each time. Maybe that’s a waste of time, but it makes the pulls consistent, which makes a better braid. 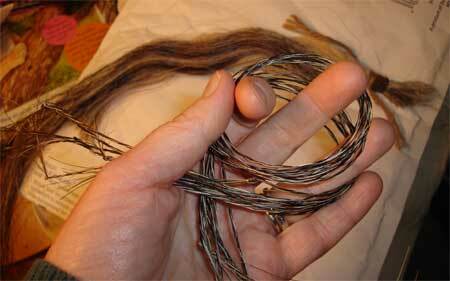 The photo below shows the hairs tied together before I twist them into a pull. To keep the diameter consistent from one end to the other, I flip half the hairs around before making the pulls. 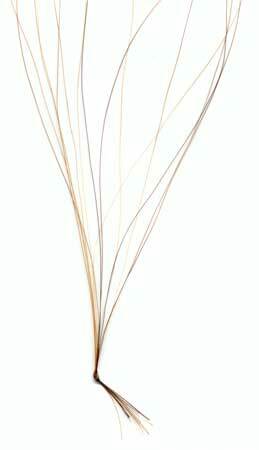 Just like people hair, horse hair is thick at the scalp and becomes every so slightly thinner by the time it reaches the tip of the hair. 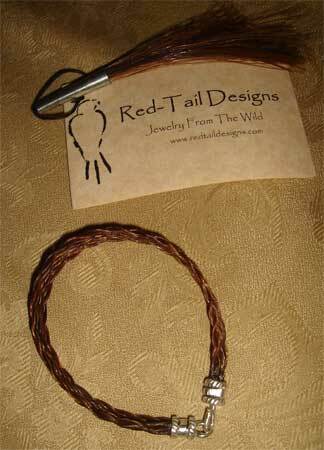 So in flipping the hairs around with the red-blonde horse, I got both colors mixed in the bracelet. In the end, it looked red because most of the blonde color was overwhelmed by the red, as you can see in the photo below. Still, it looked pretty cool in the end and the horse owner was happy. Which is what really counts. This entry was posted in Horse Hair and tagged custom, horse hair, Jewelry, knit, yarn by Susan. Bookmark the permalink.